One of the things I miss about Iowa this time of year (besides fireflies, bullfrogs and oh yeah...sweet corn!) 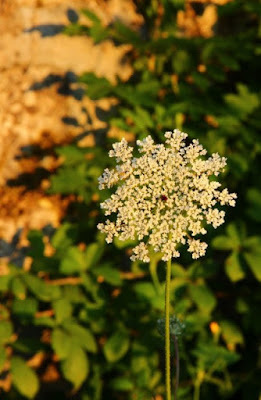 is Queen Anne's Lace. The prolific wildflowers cover Iowa roadsides and ditches all summer with their beautiful white lacy flowers. Technically, Queen Anne's Lace is not a native plant to America; it was introduced from Europe when the earliest settlers arrived. I like to think this pretty flower I saw on my walk this morning is a distant cousin of those I left behind in Iowa.